Software Piracy Protection can save you thousands of dollars every year by providing you peace of mind through password protecting your application. AppLic Security is a control which, once embedded in your software application, gives you the peace of mind that only the people who have bought your application are using it. Best of all, you can get it today for FREE! We'll only charge you when you start selling your software. Click here for more information. For developers of software on Windows, Mac, Linux and Android (Mono). You set the length of any demo period. You set a feature code to enable and disable parts of your application. 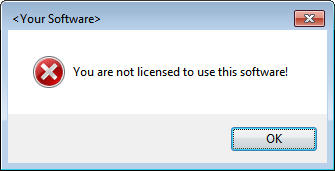 You set an expiry date so your software can be licensed. No one can use your software unless you say so! Who can use my software? Only people who have paid for it! Watch a video demonstration of our Application Piracy Protection Software.